We sat down with Tom Blomfield, co-founder and CEO of mobile-only bank Mondo, to talk about banking in the age of a life lived on your smartphone. Mobile-only bank Mondo is a young company, even in startup terms: Tom Blomfield and his four co-founders have only been at it since February. Intrigued by a few tweets and blog posts hinting at what’s in the works, I asked Blomfield for an interview, and to my surprise he accepted. Because what can there really be to talk about this soon? Is it even possible to build a bank in five months? The answer to this question is yes – the app is up and running, and the first Mondo debit cards have been issued. But the answer is also no, as Mondo is very much a work in progress: the app changes daily. “We’ve built a core banking system!” says Blomfield. 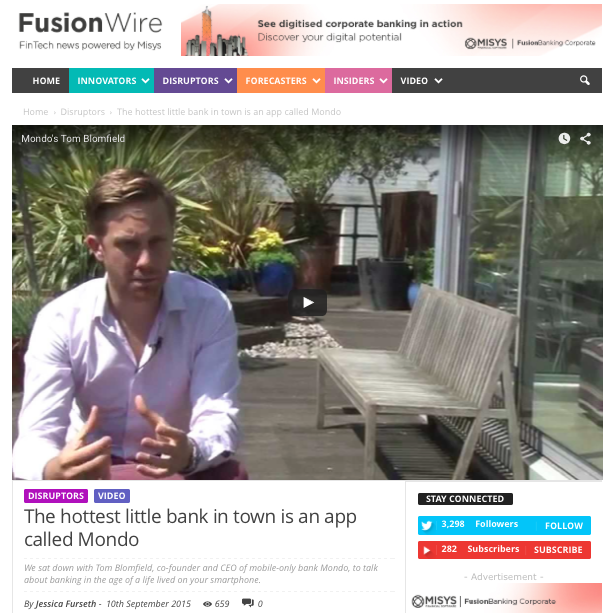 “We have our own service and infrastructure, and the app runs on top.” This do-it-yourself approach means there’s plenty of freedom in building Mondo: this bank can go in any direction dreamt up by Blomfield and his team of merry coders. It makes sense: a mobile-only current account bank for the smartphone generation begs an interactive process. “We’re trying to provide a bank account for the kind of people who live their life on their smartphones, and get angry when stuff takes more than five seconds. Like me, basically!” Blomfield laughs. But it’s right on trend: the people used to Uber rocking up within minutes, and same-day deliveries from Amazon, aren’t going to want to queue in a bank branch. Blomfield’s enthusiasm for Mondo is infectious. I eye the app jealously: my bank’s app doesn’t do any of this stuff. A mobile-only bank was bound to be fun, with features like adding emoji to transaction fields, but this looks like it could actually be really useful. This bank would be less a walled garden, and more a financial hub with direct ties to the rest of your life. It turns out my reaction is pretty normal to seeing the app: “It’s often: ‘When can I have it!’” Blomfield laughs. If all this sounds ambitious, it’s worth noting this isn’t Blomfield’s first time at the rodeo. The 29-year-old started and sold his first company, Boso, while reading law at Oxford. He then grew his second financial startup, GoCardless, to a company processing $200 million low-cost direct debit transactions annually. So what’s it like, doing this again with the added experience? Posted on 10/22/2015 by Jess. This entry was posted in Business features and tagged challenger bank, fintech, mondo. Bookmark the permalink.